Here's an old fashioned funnel cake recipe for making those delicious golden fried cakes you often see being sold at county fairs and festivals. 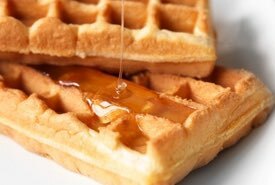 The distinctive lattice shape is created by pouring the batter through a kitchen funnel into the hot oil in a swirling pattern until it's cooked a golden brown. They look and taste amazing! Batter Ingredients: 3 eggs, 2 cups milk, 1/4 cup white sugar, 4 cups all-purpose flour, 2 teaspoons baking powder, 1/2 teaspoon salt. Method: Beat the eggs and add the milk and sugar. Sift the flour, baking powder, and salt together. Add about 3 cups flour into the egg mixture and beat until the batter is smooth and lump free and thin enough to pour freely through a funnel. Add only enough remaining flour as needed to reach the right consistency. Heat cooking oil to 375°F and using a kitchen funnel, pour the batter into the hot oil while holding your finger over the bottom of the funnel to control the flow. Keep moving the funnel to create swirls and circular shapes with the stream of batter flowing into the hot oil. 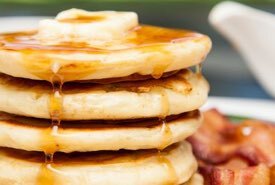 Once the funnel cakes are a golden brown, carefully remove them from the hot oil with tongs or a metal spatula, drain on a wire rack, and generously sprinkle with confectioner's sugar. Serve while still warm. 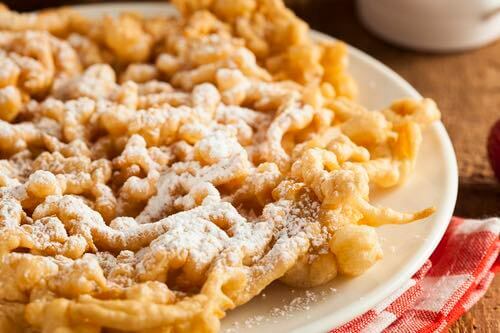 Delicious no matter how they are served, funnel cakes are often enjoyed with a topping of powdered sugar, jam, fresh fruit, or ice cream, with powdered sugar being the most popular. You'll need to forget about the calories for one day! Homemade funnel cakes are lots of fun to make too. People love to create their own so involve your friends and family, but do be extra careful around the hot oil. Be sure to make plenty of batter, though, since everybody loves eating them! I don't know what rock I was living under for much of my life, but it wasn't until 1996 that I first saw these cakes being made at Canada's Wonderland. It was fascinating to watch how the lady used an ordinary funnel to swirl and pour the cake batter into the hot oil where it turned a golden brown within the space of a few minutes. But, the moment she lifted that delicate, lattice-like, golden cake out of the oil and onto a wire rack, and then proceeded to dust it with white confectioner's sugar, I knew I wanted to try it — I HAD to have it! I quickly handed her a $10 bill and said to keep the change. I couldn't wait to bite into it. So, you can imagine my thrill to find an old fashioned funnel cake recipe in Mom's scrapbook. And now it's yours, so you can make your own homemade funnel cakes any time you want! It's a recipe that's definitely worth trying!